Sebastian Eastham (MIT) has introduced FAST-JX v7.0 into GEOS-Chem v10-01 concurrently with the UCX chemistry mechanism. FAST-JX v7.0 replaces the older FAST-J photolysis mechanism. GEOS-Chem uses a customized version of the FAST-JX v6.2 photolysis mechanism (Wild et al., 2000), which efficiently estimates tropospheric photolysis. The customized version uses the wavelength bands from the older Fast-J tropospheric photolysis scheme and does not consider wavelengths shorter than 289 nm, assuming they are attenuated above the tropopause. However, these high-energy photons are responsible for the release of ozone-depleting agents in the stratosphere. The standard Fast-JX model (Prather, 2012) addresses this limitation by expanding the spectrum analyzed to 18 wavelength bins covering 177–850 nm, extending the upper altitude limit to approximately 60 km. We therefore incorporate Fast-JX v7.0a into GEOS-Chem UCX. Fast-JX includes cross-section data for many species relevant to the troposphere and stratosphere. However, accurately representing sulfur requires calculation of gaseous H2SO4 photolysis, a reaction which is not present in Fast-JX but which acts as a source of sulfur dioxide in the upper stratosphere. Based on a study by Mills (2005), the mean cross-section between 412.5 and 850 nm is estimated at 2.542 × 10−25 cm2. 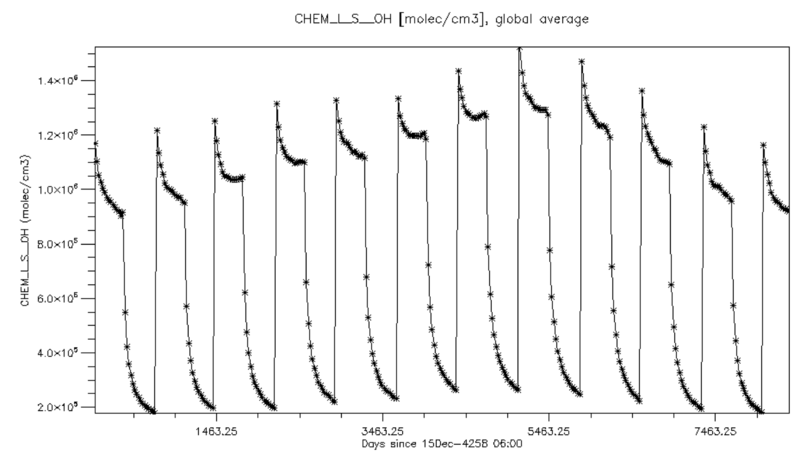 We also add photolysis of ClOO and ClNO2, given their importance in catalytic ozone destruction, using data from JPL 10-06 (Sander et al., 2011). Fast-JX v7.0a includes a correction to calculated acetone cross sections. Accordingly, where hydroxyacetone cross-sections were previously estimated based on one branch of the acetone decomposition, a distinct set of cross sections from JPL 10-06 are used. The base version of GEOS-Chem uses satellite observations of total ozone columns when determining ozone-related scattering and extinction. The UCX allows either this approach, as was used for the production of the results shown, or can employ calculated ozone mixing ratios instead, allowing photolysis rates to respond to changes in the stratospheric ozone layer. This netCDF file (originally created for the FAST-J photolysis mechanism) specifies the reference O3 and T climatologies for FAST-J. Archived TO3 data from the GEOS-5 or GEOS-FP met field archives. Links GEOS-Chem chemical species to Fast-JX species. See below for more information. Contains aerosol optical properties for brown carbon at multiple wavelengths to be used in the online calculation of the aerosol optical depth diagnostics. Up to three wavelentghs can be selected in the Radiation Menu of input.geos. These properties are also used for in the RRTMG radiative transfer model (if enabled). Contains aerosol optical properties for dust at multiple wavelengths to be used in the online calculation of the aerosol optical depth diagnostics. Up to three wavelentghs can be selected in the Radiation Menu of input.geos. Contains aerosol optical properties for organic carbon at multiple wavelengths to be used in the online calculation of the aerosol optical depth diagnostics. Up to three wavelentghs can be selected in the Radiation Menu of input.geos. Contains aerosol optical properties for sulfate at multiple wavelengths to be used in the online calculation of the aerosol optical depth diagnostics. Up to three wavelentghs can be selected in the Radiation Menu of input.geos. Contains aerosol optical properties for black carbon at multiple wavelengths to be used in the online calculation of the aerosol optical depth diagnostics. Up to three wavelentghs can be selected in the Radiation Menu of input.geos. Contains aerosol optical properties for accumulation mode sea salt aerosol at multiple wavelengths to be used in the online calculation of the aerosol optical depth diagnostics. Up to three wavelentghs can be selected in the Radiation Menu of input.geos. Contains aerosol optical properties for coarse mode sea salt aerosol at multiple wavelengths to be used in the online calculation of the aerosol optical depth diagnostics. Up to three wavelentghs can be selected in the Radiation Menu of input.geos. Contains aerosol optical properties for sulfuric acid at multiple wavelengths to be used in the online calculation of the aerosol optical depth diagnostics. Up to three wavelentghs can be selected in the Radiation Menu of input.geos. This file is only needed if the UCX chemistry mechanism is enabled. The jv_spec_aod.dat file contained the optical properties for aerosols at a single wavelength to be used in the online calculation of the aerosol optical depth diagnostics. The default properties are provided at 550 nm. These properties have been calculated using the same size and ptical properties as the jv_spec.dat file used for the FAST–J photolysis calculations. The user can exchange this set of properties with those at another wavelength. We recommend that the wavelength used be included in the first line of the header for traceability (this line is output to the GEOS–Chem log file during run time). 80: This is the internal index used by Fast-JX. When setting up the reaction in globchem.eqn, this is the number you need when indexing PHOTOL. ETP: This is the GEOS-Chem species that will undergo photolysis. PHOTON: This just makes clear that the reaction is photolysis. 0.500: This is the quantum yield of the reaction. Specifically, it is a flat multiplier applied to the first-order rate returned by Fast-JX for this reaction specifically. CH3OOH: This is the cross-section (from FJX_spec.dat) which will be used to calculate the first-order reaction rate. Fast-JX calculates the cross section data for CH3OOH, then applies the local actinic flux in the grid box to derive a first-order reaction rate. Let’s call this rate "R". Every reaction listed in FJX_j2j.dat which uses the "CH3OOH" cross section in the final column would take the rate "R" as its rate of reaction, and then multiply it by the quantum yield. In the case of ETP, we end up with an overall photolysis rate of 0.500*R.
When performing chemistry, KPP will retrieve the reaction rate from PHOTOL(80) (see reaction 544 in the standard globchem.eqn file). It ignores the "hv" reactant, yielding a final loss rate for ETP + hv of: d[ETP]/dt = -0.500 * R * [ETP]. IMPORTANT NOTE: In GEOS-Chem 12.3.2 and later versions, a duplicate entry for ClNO2 was removed from FJX_j2j.dat. In the table below, we summarize VOC photolysis in Fast-JX v7.0. We also invite you to view our Comparison of GEOS-Chem Photolysis Rates document prepared by Chris Chan Miller. CH2O = HO2 + HO2 + CO (channel a) same New cross sections leads to an increase by 10% to 20% This increase is consistent with JPL 2010. 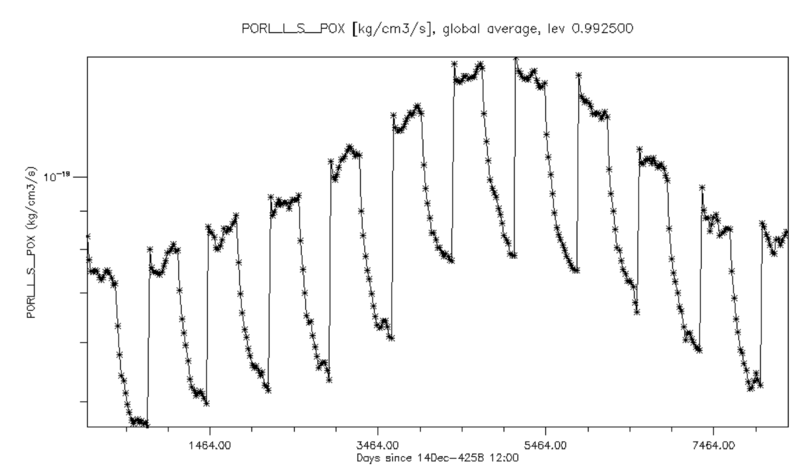 CH2O = H2 + CO (channel b) same increase by 6% to 15% This increase is consistent with JPL 2010. ALD2 = MO2 + HO2 + CO ALD2 = 0.88MO2 + HO2 + 0.88CO + 0.12MCO3 large discrepancy is found between obs and model (see Chris's slides), pressure dependence is probably needed. The cross section is now updated by Michael Prather. RCHO = ETO2 + HO2 + CO same No pressure dependence is observed, according to JPL2010. MP = CH2O + HO2 + OH same change is small. branching ratio = 0.2 MVK = MO2 + RCO3 this channel was removed in FJX v7.0, but it shouldn't according to IUPAC. MAO3 is changed to RCO3 for carbon balance. HAC = MCO3 + CH2O + HO2 rate is lower the old rate was using Acetone X sections.This species is not in FastJX v7.0. 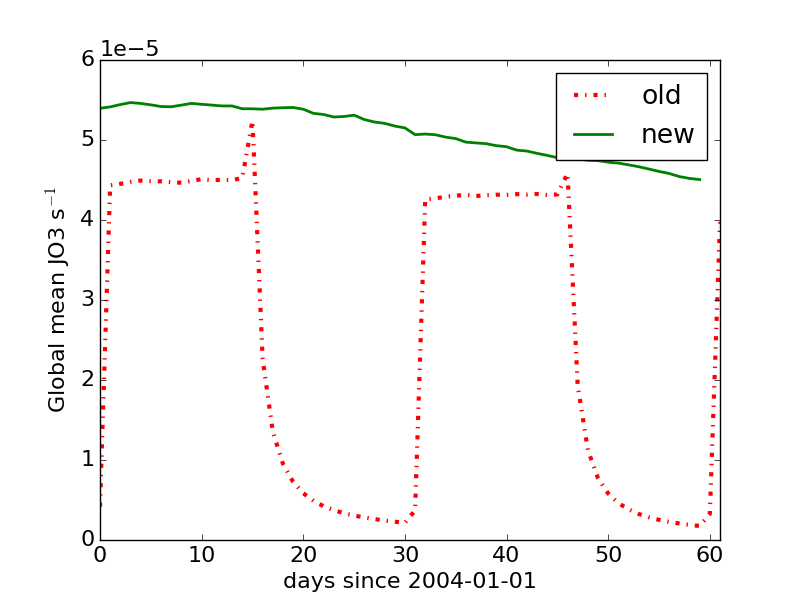 Seb added X sections based on JPL2010. Need to multiply 0.6 for quantum yield.The bins above 335nm must be zeroed out, otherwise J(HAC) would be too high. The major removal process is its reaction with OH, photolysis is of minor importance (see Orlando et al., 1999). These updates were validated in the 1-month benchmark simulation v10-01d and approved on 03 Jun 2014. I have two more suggestions to the code and I think we then can finalize v10-01c. We can deal with unresolved J(VOC) later. Seb, please let me know if you think otherwise. For HAC, keep the QY as 0.6, but zero out the bins >335 nm. These sound good to me, and I’m not aware of any other pressing issues regarding J-values. Thanks Jingqiu! If the 1-year benchmark run has already started just let it run - these changes will have very little effect except for HAC and we can just make a note of it. I'm glad that we resolved these J(VOC) issues thanks to Seb, Chris and Jingqiu. At this point we need to move on. Selecting this option will cause FAST-JX v7.0 to copy the "online" O3 tracer concentration—contained in the State_Chm%TRACERS derived type object—directly into the FAST-JX module. O3 concentrations will be copied for all grid boxes starting at the surface and ending at the top of the chemistry grid, which is either the stratopause (for simulations using the UCX combined stratospheric-tropospheric chemistry mechanism) or the tropopause (for simulations not using UCX). 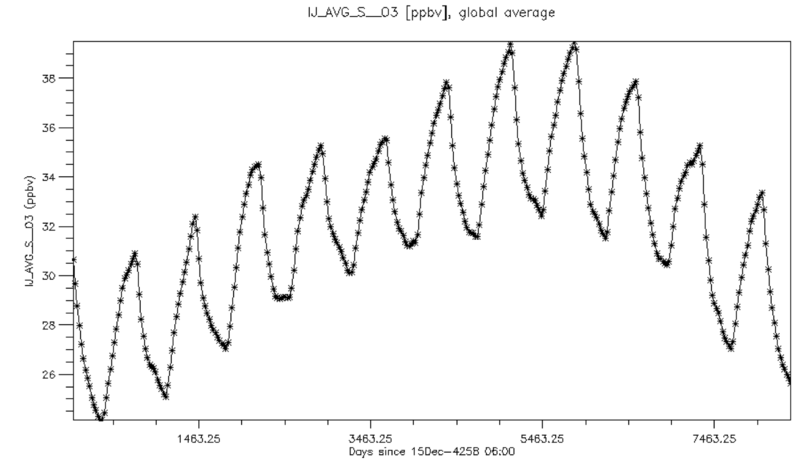 Using the online O3 option for FAST-JX v7.0 in conjunction with the UCX chemistry mechanism will allow photolysis rates to respond to the changes in the dynamically-evolving stratospheric ozone layer. This will result in a more accurate simulation. [The online O3 option in FAST-JX v7.0] should only affect the impact of tropospheric ozone when comparing between [1-month benchmarks] v10-01b and v10-01c_trop, right? The stratospheric ozone estimate from the point of view of Fast-JX should be identical between v10-01b and v10-01c_trop regardless of the online ozone option. My personal thoughts are that leaving the option on should be fine as long as we trust the tropospheric ozone estimates, although it shouldn’t make much of a difference (and if it does that is probably something I should look into). then FAST-JX will scale its internal ozone profiles to TO3 data as described in this section of our FAST-J photolysis mechanism wiki page. NOTE: This update will be added to GEOS-Chem v11-01. Jenny, you had asked about extending the TOMS data past 2010. I took a quick look at the data on the website http://acdb-ext.gsfc.nasa.gov/Data_services/merged/index.html, but I couldn’t find a lat-lon gridded product (like what we have used in the past). Maybe it’s there and I’m not looking in the right folder. Hmmm, you’re right - I can’t find that version either… All I see are 5° zonal means. I guess that will have to wait for now. To fix this issue, Barron Henderson has reprocessed the TOMS/SBUV data files that are stored in the ExtData/HEMCO/TOMS_SBUV/v2015-03 data directory folder. The GEOS-Chem Support Team has now stored these reprocessed files in a separate folder ExtData/HEMCO/TOMS_SBUV/v2016-11/. The updated version of GeosCore/toms_mod.F mentioned below has been merged into v11-01j, and has been added to the GEOS-Chem repository. The discussion regarding this issue follows below. I've been running GEOS-Chem v10 "out of the box" (geos5_2x25_tropchem) and started to look at the daily output via the ND50 diagnostic (although this also happens with daily output to the main file). More that one person here at MIT has found the same behavior within their own simulations, so I'm pretty sure it's not just me. Monthly averages look fine, and daily averages follow the long-term monthly behavior, but with a very weird cycle. At the 15th of each month, something just...stops. Certain species start to decay (e.g. OH) while others spike (e.g. O3). I've attached a few files demonstrating the strange behavior. 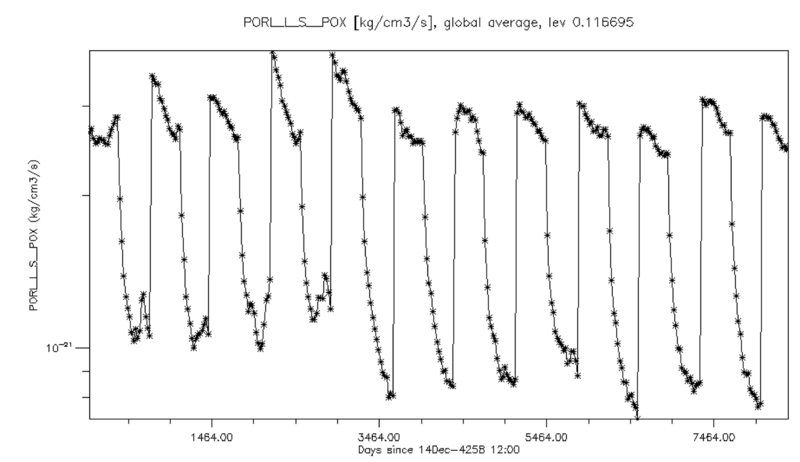 First is global surface O3 (this is every day for a year, January - December, the plotted dates are wonky, please ignore). Next is surface OH, with a similar strange behavior. I've also plotted POX at the surface and in the upper atmosphere. It seems that this happens most prominently over the oceans that over the land, and influences almost every tracer (NO, CO, PRPE, ISOP). We don't know what's going on, but we suspect that it's not an emissions problem (as a similar pattern exists in the upper atmosphere). Perhaps something with radiation? Do you know what's going on? Or point me to someone who does? After reviewing HEMCO/Core/hco_calc_mod.F90, I agree that this is almost certainly a HEMCO/TOMS compatibility issue. HEMCO identifies missing values based on the HCO_MISSVAL (hco_calc_mod.F90:849-856). All masked values are returned as 0 (hco_calc_mod.F90:1534-1536). However, I think that the TOMS NetCDF files are not masked appropriately. The TOMS netcdf files use -999 as the "missing_value" and "_FillValue" parameter, but... the actual missing values are set to -999.99. As a result, these values are not getting masked. The solution is quite simple. We just update the "missing_value" and "_FillValue" in the netcdf file. This will change the way the NetCDF library passes data to HEMCO. Updating the properties can be done with ncatted from nco with the command below. I have tested that ncdump correctly identifies the values as masked after the update, but I have not seen if HEMCO does. @Ben - Can you try this simple fix? Just update the path and run the command above for 2003-2006 (if you don't have NCO, I can make the edits and post a file for you). Then, re-run 2004. IF ( TOMS(I,J)   > -999e+0_f4  .AND. Should we set to a more sensible default value? :I had this issue with the Hg simulation and created the files with long-term mean and present day mean values. But they still have missing values at the poles in winter, so a default value might be a better option. I've changed the "_FillValue" and "missing_value" for all the TOMS datasets, but am still getting the identical cycles. I copied over the TOMS_O3col* files and made the changes, and redirected the HEMCO config file to use the altered files. Should I have done something else? I am proposing a fix for the TOMS/HEMCO issue that tries to address the immediate issue and the unobserved problem. Karl Seltzer tested the fix. I also want to note that the same problem may be in other parts of the system as well. 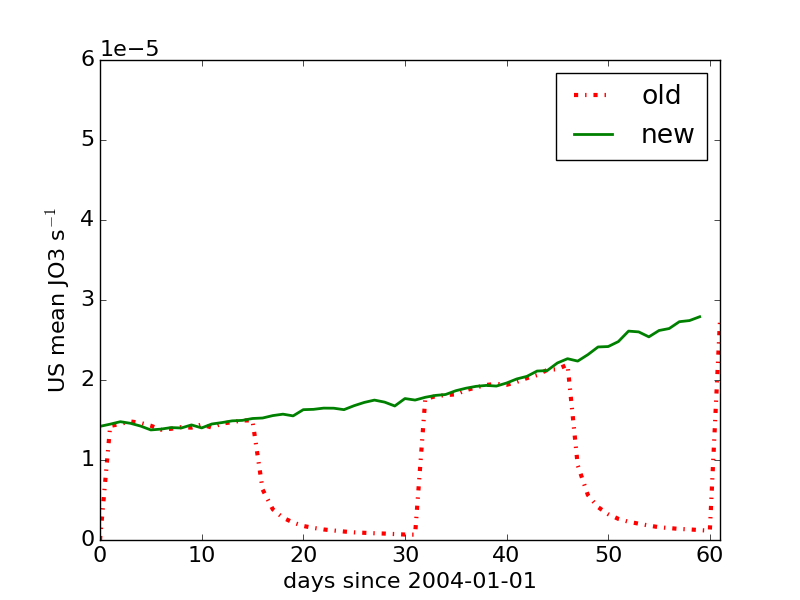 The attached figures show J(O3) for the US (old_new_us.png, 20-60N and 110W-60W) and the world (old_new_global.png) as a function of time. Note the drastically improved pattern and higher average for the world. The higher average for the world is due to using a fill value for the unobserved poles. This is a three step fix: (1) process TOMS files; (2) prepare HEMCO rc for new TOMS; (3) update toms module. The steps are described below and supplemented by the attachments. I welcome input on the proposed fix, particularly with respect to the "fill value" approach. 2) Switches from monthly mean (center) and two delta's to two edges. 3) Fills data forward in time assuming missing data is best represented by the last value available. 4) Any cells with no preceding valid value (e.g., January) with the annual mean. a) I am making a bad assumption as a quick fix/proof of concept. I am using the South pole values as a surrogate for missing north pole values -- matching season with a simple 6 month offset. If both the north and south are missing (e.g., 2003), fill the data poleward. b) This can be replaced with a better fill value later. STEP 3 - Replace toms_mod.F with the attached version. Recompile and run. As this is the default option, these lines should already be uncommented for you when you download the GEOS-Chem source code. Grid Box Optical depth = In-cloud optical depth * Cloud fraction. At present, the maximum random overlap assumption has not been implemented into FAST-JX v7.0. Because this option is computationally intensive, it remains a research option rather than a standard supported feature. We invite you to read this discussion about cloud overlap options on our FAST-J photolysis mechanism wiki page. The ability to scale aerosol optical depth diagnostic output from 550 nm to other wavelengths (originally implemented for the older FAST-J mechanism in GEOS-Chem v8-03-01) is still compatible for FAST-JX v7.0. Please see this section on our FAST-J photolysis mechanism wiki page for more information. Bromine species photolysis should probably be reactivated in the tropospheric version – given that it was online in the pre-UCX version, we may as well keep it online. Doing so is just a question of removing the 'x' in the FJX_spec.dat file for the relevant species. In fast_jx_mod, specifically RD_XXX, there is a transformation to reduce 18 cross sections to 12. Since bin 18 now corresponds to bin 12 and so on, the wavelengths are moved within the cross section array QQQ. However, the 12-bin capability is rarely used (if ever), so when Fast-JX was extended to allow cross sections with 1 or 3 sets of data, the 12 and 8 bin codes were not updated accordingly. This results in very large cross sections for acetone at long wavelengths, because the shorter wavelength data is being used instead. I've notified Michael Prather - he did not know about this bug and is putting together a fix ASAP. I've written my own fix in the meantime, which results in the acetone cross sections matching much more closely, at least between the two v10-01c versions. This update was added to the official release of GEOS-Chem v10-01 (approved 15 Jun 2015). After the GEOS-Chem v10-01i benchmarks were submitted, we learned that we were using a version of the FAST-JX input file org.dat that did not have Randall Martin's updates for better representation of OC growth with RH. So it looks like I’d assumed you didn’t have the organics updates yet, so the org.dat I sent you doesn’t include Randall’s updates in there, sorry! I do have the multi-wavelength version that does include those. The change in the org optics seems to tie in with the reduction in the organic AOD we’re seeing, so that makes sense. The BC optics are the same, so the differences seen there shouldn’t be coming from the optics. There may have been a change in the density because of a lot of BC tweaks around the same time. I’ll double check that. We will make sure that the updated org.dat file ships with the publicly-released version of GEOS-Chem v10-01. The following are active areas of research in GEOS-Chem, or ar issues that have not yet been resolved. This issue is slated to be resolved in GEOS-Chem 12.3.2. But I think that the netCDF diagnostic seems to be picking up both ClNO2 entries #21 and #101.
which is a copy of the former FAST-JX input file folder (ExtData/CHEM_INPUTS/FAST_JX/v2018-09). We edited the v2019-04/FJX_j2j.dat file so as to remove the duplicate entry (#101) for the ClNO2 species. As a result, the number of photolyzed GEOS-Chem species listed in v2019-04/FJX_j2j.dat was been reduced by 1, from 130 to 129. In order to be consistent with this update, in GEOS-Chem 12.3.2 and later versions, we have also set the parameter JVN_ = 129 in module Headers/CMN_FJX_MOD.F. The ND22 bpch diagnostic section in GeosCore/fast_jx_mod.F was also adjusted to account for the removal of the duplicate ClNO2 entry #101. GEOS-Chem 12.3.2 and later versions now read the FAST-JX inputs from the v2019-04 folder as opposed to the former v2018-09 folder.
! so that we can compute its drydep velocity explicitly. It looks from Chris Chan Miller's 2017 ACP paper like DHDC is definitely meant to photolyze; that was the source of some of the species he needed to match the isoprene products with observations. Those products are also the ones listed in the FJX_j2j.dat file, and the photolysis rate listed there (MeAcr) matches what I'd expect DHDC to have. I can't find any literature on whether DHDN is supposed to photolyze, so I suspect it wasn't meant to. At least that means this should be an easy fix; we just need to add the Is_Photolysis = T line to the species database entry for DHDC and remove it from DHDN. We know that carbonyl nitrate should be photolyzed much faster than the current rates in FAST-JX, according to this paper. But updates in this rate should also be combined with updates in the OH rate in order to better reproduce the experimental results from chamber studies. This seems more like a research question, so we decided to leave this to the SEAC4RS team. This discrepancy is very likely due to the lack of pressure dependence on the quantum yield. But Michael Prather didn’t include this pressure dependence in any of the FAST-JX versions. So this remains as a problem in all GEOS-Chem versions, including GEOS-Chem v10-01c. These updates were validated with the 1-month benchmark simulation v10-01f and approved on Approved 13 Jan 2015. I have implemented Michael Prather's pressure-dependent cross-sections for acetaldehyde (ALD2) in GEOS-Chem. The photolysis of ALD2 to form CH4 + CO is turned off. The product yields of the other ALD2 photolysis channel are also updated (see above). Pressure-dependent ALD2 photolysis leads to a decrease in J(ALD2) at the surface and an increase at 500 hPa. The effect on PAN is small (1-5 pptv increase at the surface and <2 pptv at 500 hPa in July 2005). The SMVGEAR solver will be removed from GEOS-Chem v11-01, when the FlexChem solver package is implemented. At that time, routine calcrate.F will be removed from GEOS_Chem. The code for EP photolysis found in calcrate.F needs to be updated for compatibility with FAST-JX v7.0. The EP photolysis code was left unchanged for now (as of GEOS-Chem v10-01c), but it is now executed only when LDICARB is true. This issue affects the dicarbonyls simulation.
! Not yet modified this for compatibility with Fast-JX v7.0. Blitz, M. A., D. E. Heard, M. J. Pilling, S. R. Arnold, M. P. Chipperfield, Pressure and temperature-dependent quantum yields for the photodissociation of acetone between 279 and 327.5 nm, Geophys. Res. Lett., 31, 9, L09104, 2004. Eastham, S. D., D. K. Weisenstein, S. R. H. Barrett, Development and evaluation of the unified tropospheric–stratospheric chemistry extension (UCX) for the global chemistry-transport model GEOS-Chem, Atmos. Environ, 89, 52-63, doi:10.1016/j.atmosenv.2014.02.001, 2014. Feng, Y., et al., Effects of cloud overlap in photochemical models, J. Geophys. Res., 109, D04310, doi:10.1029/2003JD004040, 2004. Liang, X.-Z., and W.-C. Wang, Cloud overlap effects on general circulation model climate simulations, J. Geophys. Res., 102 (D10), 11,039–11,047, 1997. 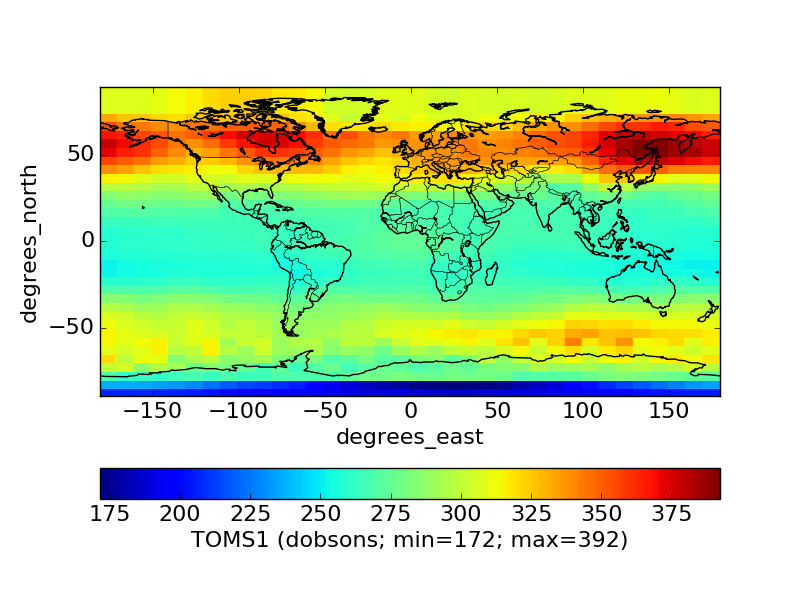 Liu, H., et al., Radiative effect of clouds on tropospheric chemistry in a global three-dimensional chemical transport model, J. Geophys. Res., 111, D20303, doi:10.1029/2005JD006403, 2006. Magneron, I., A. Mellouki, G. Le Bras, G. K. Moortgat, A. Horowitz, and K. Wirtz , Photolysis and OH-Initiated Oxidation of Glycolaldehyde under Atmospheric Conditions, The Journal of Physical Chemistry A, 109(20), 4552-4561, doi:10.1021/jp044346y, 2005. Müller, J.-F., Peeters, J., and Stavrakou, T., Fast photolysis of carbonyl nitrates from isoprene, Atmos. Chem. Phys., 14, 2497-2508, doi:10.5194/acp-14-2497-2014, 2014. Orlando, J. J., G. S. Tyndall, J.-M. Fracheboud, E. G. Estupiñan, S. Haberkorn, and A. Zimmer, The rate and mechanism of the gas-phase oxidation of hydroxyacetone, Atmos. Environ., 33(10), 1621-1629, doi:10.1016/S1352-2310(98)00386-0,1999. Tie, X., et al., Effect of clouds on photolysis and oxidants in the troposphere, J. Geophys. Res., 108(D20), 4642, doi:10.1029/2003JD003659, 2003. Stubenrauch, C.J., et al., Implementation of subgrid cloud vertical structure inside a GCM and its effect on the radiation budget, J. Clim., 10, 273-287, 1997. Wild, O., X. Zhu, and M. J. Prather, Fast-J: Accurate simulation of in- and below-cloud photolysis in tropospheric chemical models, J. Atmos. Chem., 37, 245–282, 2000. This page was last modified on 10 April 2019, at 20:59. This page has been accessed 69,008 times.